Despite the fact that gambling is one of the most popular recreational hobbies in the world, casinos are always the subjects of controversy. Depending on specific countries and laws, casinos are often subjected to various limitations and restrictions, and in many cases are outlawed altogether. This is why, over the course of the past decade, many have turned to online gambling practices. Even online, however, restrictions have become problematic for many gamblers and game players. Though there are plenty of sites, like betfaircasino.com, Party Poker, etc., with massive followings and dynamic Internet casino options, regulations are tricky, and many still prefer “real life” gambling. This is why the introduction of two new integrated resorts (resorts with accompanying casinos) in Singapore has been so significant for tourism. The Marina Bay Sands Resort and Resorts World Sentosa have the potential to bring new waves of tourists and casino enthusiasts to Singapore. Here are a few specifics on each resort. 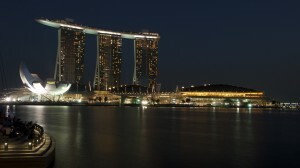 Officially opened in 2010, the Marina Bay Sands Resort brings Las Vegas to Singapore in absolutely breathtaking fashion. Located right on the Marina Bay, the resort is a visual spectacle, as is to be expected of the world’s single most expensive casino property. Featuring over 2,500 rooms, 500 card tables, and 1,500 slot machines, the property is massive in every sense of the word, and is stuffed with all of the features and luxuries people expect in lavish casinos. World-class pools, a rooftop “Sky Park,” and celebrity chef establishments are just the beginning. Located on the Sentosa island off the southern coastline of Singapore, this resort is geared a bit more toward entertainment and traditional tourism than luxury and gambling. The resort does contain one of Singapore’s two integrated casinos (a massive tourism attraction on its own), but other attractions include a Universal Studios theme park and the Marine Life Park (essentially a massive aquarium). That’s not to say this isn’t a traditional casino/resort, however. High-end shopping, Joel Rubuchon restaurants, and of course those alluring card tables all add to the experience. Ultimately, the overall effect of these two integrated resorts on Singapore’s tourism scene remains to be seen, as both are still very new. But given the demand for attractive gambling locations all over the world, it’s hard not to see substantial success in the future of both Resorts World Sentosa and Marina Bay Sands.